« How Involved Should Your Man Be In The Wedding Preparations? Planning a destination wedding is full of challenges. Aside from the usual considerations of a traditional wedding, there are other factors that you need to know. To make sure your wedding is a relaxing treat for you and your guests, here are the things that you must include in your planning. The first thing to decide on for a destination wedding is where you want to be wed. Would it be along the coasts of an exotic island? Are you going for the serene beauty of an out-of-town garden or be more adventurous and declare your love atop a mountain? The ‘where’ is important because this is the basis of all the other considerations. Who is Attending Your Wedding? 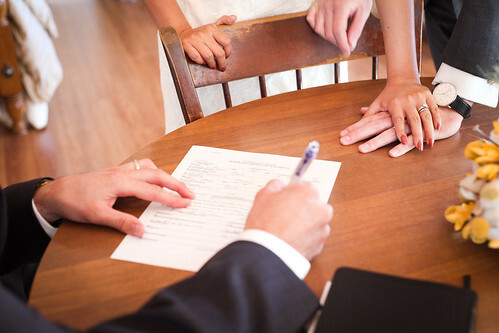 Traditional weddings require an RSVP to determine budget and accommodations. The importance of RSVP is even more amplified when you are having a destination wedding. Since your guests have to go out of their way to attend the ceremony and reception you have to be very considerate of their needs. If you have guests with disabilities or those with children, special consideration must go into the planning for their transport and accommodation. Although you are not expected to pay for airfare and other travel expenses, it is a good etiquette to help your guests arrange their travel plans. You can also scout the internet or travel agencies for the best deals or group discounts on airfare and other transport needs. The guests and the entourage are not the only ones who need transport. One area that needs careful planning is how to transport the bridal gown, the groom's attire and those of the entourage. Make sure your garments are transported properly, especially those that have embellishments like laces and bead work. It is also wise to choose garments that are simple and made of light materials because they are easy to move around in and easy to transport. Do you fancy an exotic botanical garden wedding or a tropical island wedding? If you are, it is wise to plan around the more favorable weather of the state or country that you choose. A plan B is always required in the case of a rain pour and other weather related hitches. Some major considerations of destination weddings are the legal requirements that need to be fulfilled for the wedding to be acknowledged by your home country. Aside from the basic requirements such as certificates of birth, a valid passport and a divorce decree for previously married individuals; your destination might require other documents. Traditionally the couple or their parents pay for the bride's and groom's attire and the wedding reception. The case is the same with destination weddings wherein you are not obligated to pay for your guest's clothing, wedding and shower gifts, airfare and accommodations. If you are able to afford it, you may choose to subsidize or pay for transport and lodging but that is up to you. Always make sure to disclose who pays for what to your guests. Although you are not required to pay for it, where your guests will stay should be included in your planning. Look for villas, all-inclusive resorts, or other forms of accommodation that have can cater to several number of guests. Also, inquire for discounts and special pricing that your guests can take advantage of. Planning the destination wedding you have always dreamed of need not be stressful. Remember that planning ahead and planning carefully is the best way to a smooth sailing wedding.